Published On Sunday, August 12, 2012 By admin. 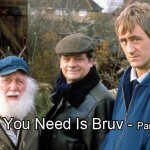 Under: Featured, News, Only Fools and Horses. 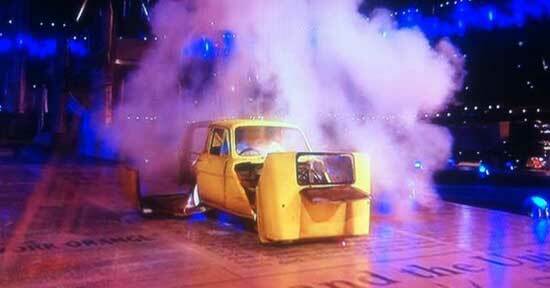 Update after ceremony: It didn’t look like David Jason and Nick Lyndhurst playing Del Boy and Rodney in the Closing Olympic Ceremony to me though it was a classic scene that few Americans would of understood. They are probably wondering how the caped crusaders are ever related to a Reliant Regal Super Van? With Michael Caine’s classic 1969 film The Italian Job with the famous line: about only supposed to blow the doors off the sketched kicked off the ceremony. It was shown on the big screens at the same time as 1980s pop stars Madness singing one of their most popular hits, Our House, indicating a real street party atmosphere. If Del could make a comment about the ceremony, what would it be? Obvious. ‎”I don’t care what they say, you can’t whack The Who”! 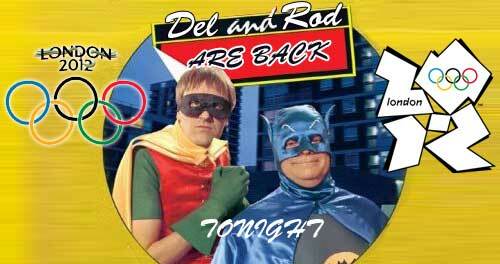 Before: Their are very strong rumors that David Jason and Nicholas Lyndhurst will reprise their roles of Del Boy and Rodney Trotter, with their Reliant Regal Super van reportedly being blown up in a sequence in which they pretend to be Batman and Robin. After 18 years since the dynamic duo gave us the classic episode Heroes and Villains we may well see a site we never thought possible. Surely Del and Rodney are the perfect representation of Londoners and the very British attitude of never giving up when your down. With Danny Boyle’s input , who knows what to expect tonight. Who can forget the lasting image of Del and Rodney with the three wheeled van and trying to check fo a petrol leek with their cigarette lighter in the middle of Peckham high street. Yeah that’s a good idea Jimmy he could be the new “Soppy Old Git” because that’s what I think is majorly missing from the newer episodes.I might write a script with him as the old man. Think its a case of “he who dares wins”! Bring Ofah or if not GGG back. Bring back characters we love, lets have a catch up. Otherwise it will always be a case of what if, and regret. Nothing to lose and all to gain. What is Paul Barber doing at the monent? nothing much , get him to pay boycie a visit as denzil.Get Trigger to pay a visit. Even better get del and roddres down for a visit. There nothing to fear. It would be great television. And to continue that idea for a story del and rodney could be filling the lorry with bottles of country wine as Boycie as his own vineyard, Denzil is getting stressed as he doesn’t want to take the wine plus del boy and rodney in the back of his lorry. when he returns he says “bloody hell! 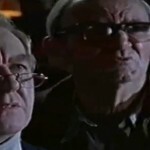 he cant see del and rodney cos the lorry is full of wine ! Just thought of another cracking idea for an episode. 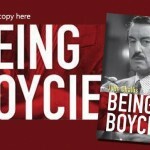 Imagine this – Boycie has invited Denzil and Trigger down to see them at the farm. Del manages to find out about this trip and persuades denzil to take him and Rodney in the back of his lorry, but del tells denzil to not tell Boycie as he wants to surprise him as he hasn’t seen him in years. Que – Del boy and Rodders get out of the back of the lorry, Del says “what was that Boycie” then Rodney says dont you mean “Aubrey” Then boycie does his laugh and the episode starts from there. And would make sense for the bbc as lets face it not many other series can guarantee 15 million or more viewers! Advertised correctly could see massive viewing figures as we haven’t seen them since 2003. .Sir David Jason and Nick Lyndhurst not wanting to commit to another special for specific reasons such as respect for John Sullivan, and remembering the negative feedback the last 3 specials received. We loved them, but your average Joe didn’t. It just wasn’t the same feel as a normal Fools. However, other members of the cast who, with all due respect, probably aren’t spoilt for choice with TV work, would jump at the chance to appear in a new episode. .John Sullivan might not have actually thought or written any ideas for a new episode. If he did, it might not have been complete. Nobody would interfere with that. Not even his son. .Would the BBC budget for this? I’m not so sure. Stingey bastards won’t even add in deleted scenes on DVD releases. I do see exactly where you coming from. However i still believe they should make some sort of an episode. 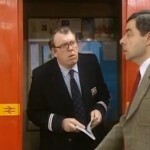 I dont feel it would be disrespectful for say del boy and rodney to appear in a ONE OFF XMAS SPECIAL of GGG thats all im talking about, infact the story could write alot of itself here as them simply visiting Boycie is the story itself obviously seeing them cathcing up spending xmas with them etc whatever really. I think there would be no danger in making this at all. And could be dedicated to john sullivan by his jim, (Who has wrote GGG episodes in the past) and by david and nick agreeing to do this one off special would be in memory of John and treat for all us fans. If the bbc can commision The royal Body guard starring david jason which with no disrespect to david but in my opinion dreadful, then he surely wouldn’t have to think twice about appearing as del boy in a green green grass special and the bbc should welcome bringing back one of its most loved characters. I this really isn’t going to happen please simply bring Green green grass series 5 onto our screens. The next best thing perhaps with a visit from Trigger that would be possible surely???? Is green green grass series 4 going to be released on Dvd this xmas? Most of us would, deep down. It is not the answer to today’s comedy problems though. Just a temporary measure. No it isn’t but it would make millions of fans happy. Where are all the OFAH fans??? That’s something I’ve never understood? Why don’t people want another ofah? “Leave the legacy alone”? Why can’t u just build on that legacy just 1 more time? With the right acting and wrting (which it inevitably will be) it would make the legacy even better? Strange i expected lots of fans comments on here also wanting more Ofah. Im not saying do a series with a total stranger writing the script im saying why not encorporate Johns ideas for the new episode which he obviously must have jotted out an outline and also spoke to someone about what he had planned. Just think it would put a smile on so many people faces to see the trotters back. There absolutely no tv series to watch nowadays. All we get is reality tv, x factor, the voice big brother. Where all the nice tv comedy series gone??? Used to enjoy them, men behaving badly, vicar of dibley and goodnight sweetheart. 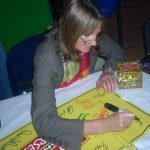 If you’re a writer, then writing a decent sitcom is one of the hardest creative things to do. Infact, it is the hardest and most creative thing to do. Comedy is written completely differently in each decade. We’ve quite possibly entered the weakest decade (2000-2010) in comedy history. Obviously, you have The Office, Peep Show and Gavin and Stacey as examples of decent comedy in that era, but over a period of 10 year or so, the average comedy written was very weak. You only have to look at Nicholas Lyndhurt’s sitcom, which I can’t remember the name of, and shows like Two Pints of Lager etc.. weak comedies. So, today’s writer has to now enter a new era of writing to write something original. This is may be untrue but my friend (who is also a major ofah fan) told me (roughly 2 months before john passed away) that he had read somewere john had starting to write a script? ‘IF’ this is true I could see no reason why, Jim Sullivan couldn’t take over and finish it off, with David’s and Nick’s Input? Who Know’s Jim May have already Finished it and there just starting to film it in the coming weeks? Highly unlikely I know, if he had started to write a new episode I’m sure it would be along the lines of ryan’s idea’s with the wedding and stag etc.. But if thats the case why are all the cast saying its finished and they couldn’t possibly make another one without John having wrote it. Its terribly frustrating, even more so because of the fact they were clearly going to make a new episode! Can Jim maybe kindly leave a message on this site informing us if they are planning on making a new episode or not? Just want to know. And if not why not do the del and rodney visiting Boycie as a green green grass xmas special, anything for us fans to look forward to. xmas isn;t the same without the trotters. Oh please… it was not them or they would say something! Or they wouldn’t be in a costume! Although it’s in an episode. Even bring green grass back and we see Boycie starting up a new B and b down at the farm. Think this would be so funny, he would be a snobbish hostess and can see many funny things happening almost Basil fawlty style. Think there massive potential here with Marlene being interesting hostess also, make the farm workers responsible for doing breakfast for guests. Something i noticed in Sleepless in peckham is when Del seemingly remembers Freddy the frog, this contradicts frogs legacy episode totally doesn’t it. Strange how they could make this mistake isn’t it? I quite enjoyed parts of this episode especially the birth where the drama was good, and such a relief cass had baby. Just find the freddy frog thing annoying as it doesn’t comply with OFAH history as del suddenly remembers him and said he used to call him uncle freddy whereas frogs legacy he has no recollection of him at all. Still a good episode none the less. If you notice, Del Boy only knows him as uncle freddy and not freddy the frog or Freddy Robdahl. That is why he didn’t know who he was. yea but to have no recognition at all strange in frogs legacy. You think Freddy would remind del of something even if he was young. Especially when he was described as close friend of his mum. Does any body know if scripts were made? Surely even if half completed John must have outlined a story and confided in someone in what he wanted to happen whether it be his son Jim or david and nick. Just think they should make it so strongly. 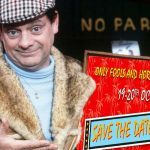 Whats even more frustrating is all the actors were previously before the sad passing of John all up for doing a new episode, rememember seeing David jason on this morning and he was indicating he would welcome playing del boy again. And nick also said he would welcome a comeback. If there is a script even half completed please make episode, such ashame if it is left uncompleted as John had clearly planned on bringing them back for one last time and all the actors were keen to return. If not surely green green grass could continue? i especially enjoyed the festive specials of this series also. While we all equally wish for a new episode of OFAH, we all know at the back of our minds that it’s extremely unlikely. We all hope that the great John Sullivan prepped scripts well in advance of a potential come-back, and that his son, Jim, has a talent for writing. I am not so sure Jim is anywhere near John in terms of writing talent – and that is nothing to be ashamed of. Ryan , i must say I 100% agree with you! , a new episode and to end ofah ‘properly’ is what’s needed! I love your idea’s aswell , a perfect tribute to the legend that is John Sullivan also to end ofah once and for all , A 90 minute special to tie up all the loose ends. This is probarly not true but I did hear rumours before John passed away he was working for a few weeks on a new script? Whether it was for green green grass or ofah I’m not sure. Regardless of the actors age’s it would be fantastic! Del and raquel getting married , Rodney his best man , marlene and Boycie , trigger the whole crew at the wedding would be magnificent. Please BBC make 1 last episode Xmas 2012! It would be the ultimate festive treat, and naturally a wedding would bring everyone together for one last time and end with a positive, fun episode, i feel that personally Del finally getting married would be the perfect ending to the series, and the rumours are that John wanted Del to get married for the potential aniversary episode which obviously didn’t happen due to the sad events. This xmas please bring OFAH back. Dedicate it to the great late John Sullivan and lets see Del boy finally get married! And say his final Bonjour to the British public. Russell thanks for nice comments about my ideas just wish it will happen. Feel it right time now, like isaid if it doesn’t happen now this xmas then i feel it wont happen sadly. There so many reasons why they should do it. I mean whats the point worrying and thinking of reasons why they shouldn’t do it. Lets be honest the 1996 ending was the best ending the series could have had, but it came back with 3 new episodes, which weren’t bad by any means, i enjoyed them in parts with some nice scenes eg rodney and cass having baby, rodney choosing their mums name and adding it to grave, rodney as russel crowe hilarious and strangers on the shore being quite entertaining with gary, bringing back to the flat very funny. Bring them back, lets not worry and just enjoy a Trotters wedding. Maybe a 2 part special, the first episode dels stag night then the actual wedding. I guess only Johns son knows if he had started or finished writing a script if he had then i think they should make it. Arrrh its a difficult one given the circumstances i know but it would be a joy to see them return and could be a fitting ending if only they have the courage to make it. Do people out there want more OFAH ? i JUST CANT HELP THINK WHY NOT? Doing anybody know when the complete Green gree grass series will be released as boxset including series 4? I have been looking out for this for ages now ? Thanks for comments about liking my ideas. 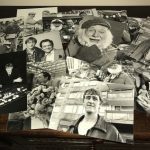 Hope Johns son will consider writing an episode, even better if John himself had completed or nearly completed a script for a new OFAH episode but i guess if he had then they would have made the episode or informed the public that John had finished the script. Wouldn’t it be an amazing surprise if he had infact finished a whole episode and that was to be released this xmas……? Another idea would be to bring Green green grass back and Boycie deciding to start a new Country Bed and Breakfast from his home. Think this would have the potential to be hilarious! And keep the series going and fresh. As we all know Boycies snobbishness and rudeness. Some very funny scenarios could occur – Fawlty Towers like, but different setting. And imagine Marlene as B and B hostess. Whats everyone think of this idea??? Ryan – I think you need to keep these ideas close to yourself and attempt to put this to the ultimate test and make it a script – before somebody else on here nicks it! I expect it could work though. There are plenty of moments like that I suppose. The episode could start with green green grass opening theme tune mixed with xmas jingle. Rodney as best man doing emotional, poignant sppech thanking del for looking after him when he was younger. Slater turning up but maybe he genuinely is wishing the happy couple well and has mellowed with old age. Trigger finding out he is the brother of one of the locals down at Boycies farm. The episode set at xmas would be a wonderful feel good way to end the series, all the characters having fun, partying and celebrating. The episode ending with MR and Mrs Trotter returning to Nelson Mandela house, then the snow starts to fall as we hear the closing ofah theme tune for the last time. The possibilities are endless tahts why i think it should be made. It would 100 per cent work. Just think it should be done this xmas. I am sick of reality tv where all the comedy series gone? The possibilities are endless for an ofah / green green grass special. Imagine Rodney Dels best man, could to an emotional poignant speech thanking him for looking after him when they were younger. Trigger would surely become friends with the strange locals down at the farm, or perhaps maybe one of them turns out to be his long lost brother? Then the episode could end with Mr and Mrs Trotter returning to the flat in Peckham husband and wife. A real nice ending, feel good episode, set at xmas, the snow could start falling as Del attempts to carry Raquel up all them stairs as the lift is broke and then the end credits role, with the snow falling down on Nelson Mandela. And then for one last time we hear the original ofah closing theme tune. Just more ideas really, feel like if they dont make it this xmas then it will never happen. Ok, this idea was a bit sickily! How did you go from the original superb idea to this?! haha. I personally thought would make for a funny episode and a nice ending. But hey everyone has different opinions and unfortunetly i dont think it will happen like you said. PS does anyone know if green green grass series 4 will ever be released? Really dissappointed David and Nick didn’t make an appearance for this one off oppurtunity. What i think would be a fantastic way to end ofah and green green grass which could be done via John Sullivans son doing script and perhaps encorporating some of Johns ideas of how he wanted to end the series would be to do a Green green grass / OFAH xmas special where del boy and rodders go visit Boycie perhaps the story being Del is getting married to raquel at church in the country and Boycie could hold the wedding reception at the farm. Can think of hiliarious things that could happen, even holding dels stag night at Boycies also would be amusing. What everybody Think? I would love to read a fan script of Del getting married to Raquel at a church in the country and Boycie could hold the wedding reception at the farm. Only if John has scripts prepared in advance would anything be possible though. I can’t think of a comedy that has been re-produced with new writers. great to see. according to papers today not actually David Jason and nic lyndhurst still great to see though. makes me think : new episode please !!! All the same – great British comedy put to the fore!